daily dose of spazz: Time to Par-tay! My sister tells that joke every chance she gets, and although we all know the punchline, we always play along. Annoys my brothers, which makes her do it more. Simple, card with bright summer colors. Cameo coral and Summer Sun, in case you were wondering. Stamp is from A muse. Colored the drinks themselves (cosmo, mai tai and margarita) with prisma pencils and gamsol, then colored the flowers with gel pens to make those really pop and the drinks to appear more transparent. Punched with a scallop punch and added some Black Glaze pen doodling. 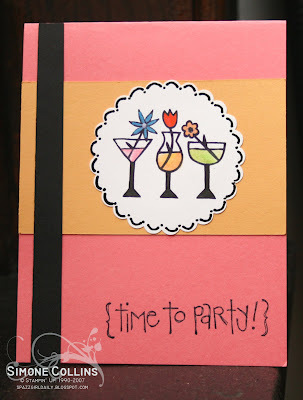 The "Time to Party" stamp is a $1 stamp from Michaels. Love the colors and boy could I use one of those drinks! Great use of $1 stamp, love those things! Very cute- love those $1 stamps! Very cute card and I love that pink! I wish that my LSS sold Amuse Stamps. Love it, Simone. Makes me want to have a watermelon 'tini! Wanna join me? This is cute! love the colours used!